What a fabulous weekend, filled with three great cooking classes – two a part of my At Home with Heidi series and the other a private cooking class designed for a group of 10-year-old-chefs-to-be celebrate a birthday and make dinner for Saturday night sleepover! Earlier that Saturday morning my At Home with Heidi Gluten Free Gourmet cooking class was a huge success; and in addition to a wonderful soft gluten free white bread we also created a heartier gluten free bread with Locally produced Chestnut flour from my good friends at High Rock Farm in Gibsonville NC. 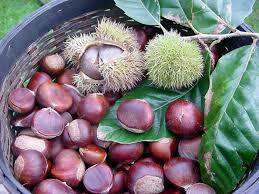 High Rock Farm is the largest working and producing chestnut orchard in the mid-Atlantic region with a grove of nearly 500 chestnut trees. While the farm is chestnut-centric, High Rock also produces a hearty crop of pecans each fall from some 400 pecan trees; and in the spring visitors can look to enjoy the annual blackberry harvest. 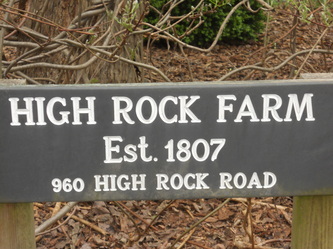 High Rock Farm was built in 1807 by Joseph McCain, Senator John McCain’s fourth great-grandfather. This federalist style home features many large rooms including eight fireplaces, antique furniture, and beautiful landscape. High Rock Farm is one of North Carolinas Historic landmarks and is listed under Preservation North Carolina. 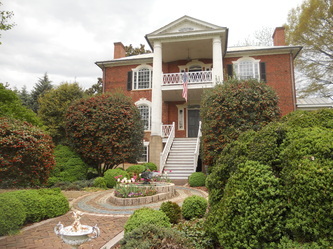 The farm house sits off High Rock Road and was used as a stage coach stay in the 1800’s. At one time, the house was also home to a local tavern and area post office. Today the historic house is home to Richard Teague who planted his first chestnut tree in 1991, and is available for home and farm tours by appointment. Pecans are generally harvested in October and then packaged for sale directly from the farm, but they go fast! To extend the life and flavor of the pecans High Rock Farm also produces and sells sugar toasted pecans and chocolate covered pecans as well as their chestnuts, chestnut flour, dried chestnut kernels and in season fresh blackberries and raspberries and as well as their own blackberry jam. These fabulous local products are available all year round. If you are looking to cook gluten free – chestnuts and pecans will be a great healthy addition to your diet and kitchen pantry. The fact that these nuts are a local North Carolina product, makes them all the better! 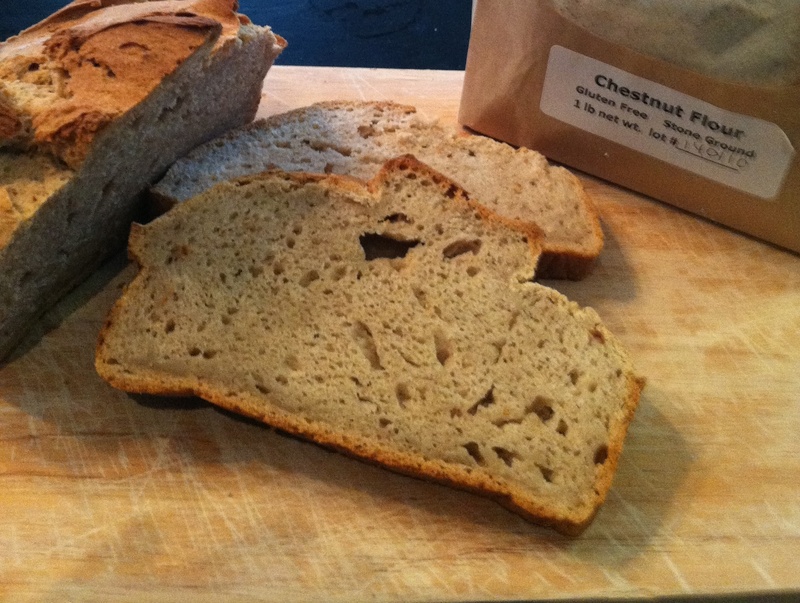 High Rock Farm’s Chestnut flour may be used in any gluten free bread or baked good recipes to give a heartier taste and texture similar to that of whole wheat flour. 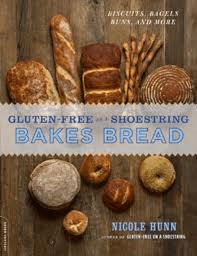 Below you will find the High Rock Farm Chestnut Flour Bread recipe I developed for the class – I was inspired by a great little cookbook called Gluten Free on a Shoestring. See details at the end of this post. This fresh baked bread is best enjoyed once it is out of the oven and has been allowed to cool completely. While it is tempting to cut it while it is still hot from the oven, with the bread cool, it may be cut to a thinner slice and is perfect for sandwich bread. 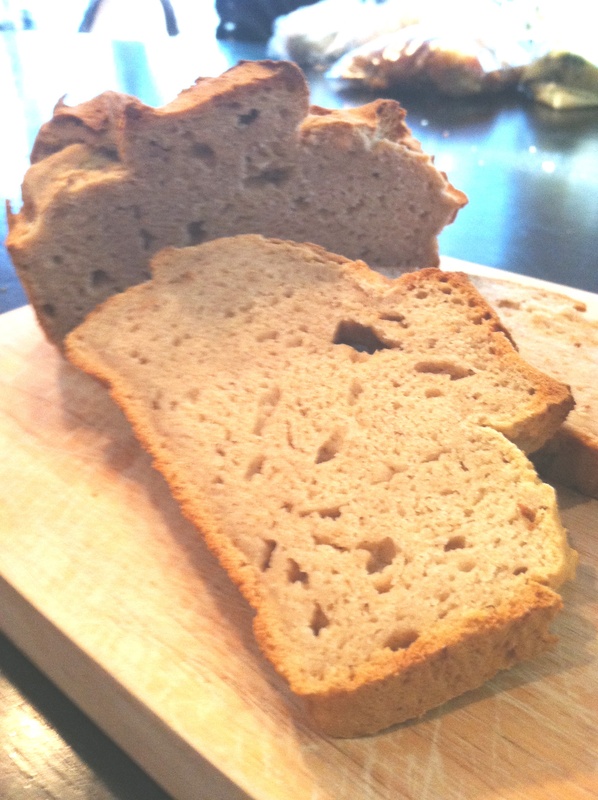 If you would like to serve the bread warm (Gluten free or not – who doesn’t love warm bread?) wrap the completely cooled loaf in foil and reheat in a 250-300 degree oven. If you cut into the loaf hot out of the oven just after baking, the interior will still be damp with steam. If you wait and rewarm the bread, you will be rewarded with much better results both in terms of taste and texture. Just a couple of recipe notes before we begin. 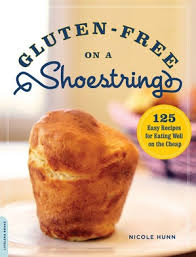 After doing a lot of research and trying several different gluten free flours, my favorite blend in the gluten free flour blend from Trader Joe’s – it seems to work the best in all sorts of baking, from yeast breads to cobblers which rise with the addition of baking powder or baking soda. so we’ll start with 2 cups of this all purpose Gluten free flour as the base for our bread and then blend in the wonderful High Rock Farms Chestnut Flour to give our bread the nutty tasting finish. 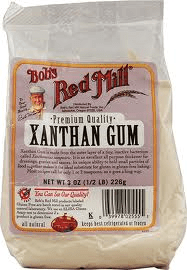 The Xantham Gum is a very important part of the Gluten free yeast bread equation. It is the ingredient which interacts with the yeast – in place of the gluten found in regular all purpose flour – to give your bread dought the elasticity to rise. 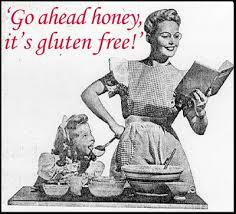 Some gluten free flour mixes already include xantham gum, but I prefer to use a mix that does not and add my own. In manufacturing, xanthan gum is used as a thickening, emulsifying and stabilizing agent in foods such as chewing gum, toothpaste, bottled salad dressings, etc. and it works exactly the same way in your yeast bread, but to make it work the most effectively, you really need to mix it in vigorously – which is why mixing this batter up in a stand mixer is the best way to blend the batter. Finally about the yeast – Yeast is a living growing organism and is what gives your bread dough the power to rise. 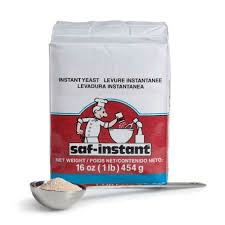 Normally a package of yeast must be proofed before you use it in any yeast bread so that you can be sure it will indeed rise. To proof yeast, simply mix a tablespoon with tepid water and a bit of sugar and stir, as soon as little bubbles form on the surface of the water, the proofed yeast is ready to add to your bread dough. 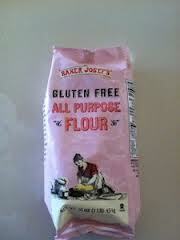 2 Cups Trader Joe’s Gluten Free Flour Blend ( after experimenting around, I think this is the best gluten free flour blend on the market. Combine the gluten free flour blend and the chestnut flour in the mixing bowl of a stand mixer fitted with the paddle attachment. Add the xanthan gum, cream of tartar, sugar and yeast, salt and blend on low speed to combine the dry mix well. 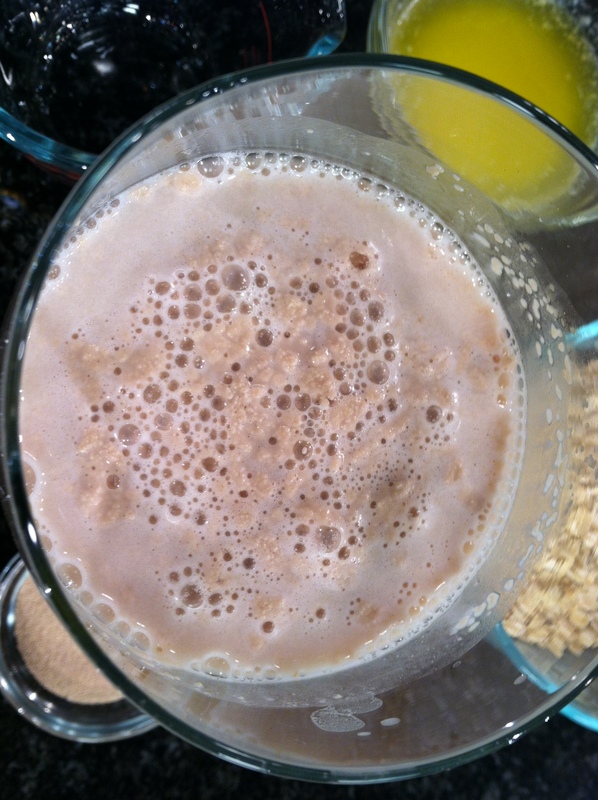 Add the milk, cooled butter, vinegar, eggs, to the dry ingredients and then combine until well blended on low speed. Once the wet ingredients have been incorporated into the dry ingredients, turn the mixer up to high speed and allow to mix for about 5 minutes – yes 5 minutes – gotta work up the xantham gum so it can do its job! Once the dough is blended, spoon it into a buttered and parchment paper lined bread pan. Allow the dough to rise in a warm but not hot spot for about 30 minutes. Bake in a preheated 350 degree oven for 45-50 minutes or so. Allow the bread to cool for about 5 minutes in the pan and then use the parchment paper to lift the bread out of the pan and allow it to cool completely before slicing – enjoy! Check out these two cookbooks for more great gluten free recipes and of course more ways to use the High Rock farms chestnut flour – substitute it in any gluten free recipe for up to half of the flour called for in the list of ingredients for a fabulous nutty flavor to your final baked product.